Combining artistry and engineering, Mark Stasz builds the vast and creative illusions that live in his imagination. Working with steel, bronze and stone, and the tools that are his prized possessions, he brings his classic yet contemporary works of art to life in the multi-layered process of sculpture creation, which satisfies him as much as viewers’ positive feedback. His massive sculptures and fountains draw viewers in, urging them to admire the natural aesthetics and ponder the juxtaposition of delicate curves and bold configurations. Mark’s work is largely intuitive. He blends an inherited family gift of artistry with an engineer’s innate sense of form, structure and balance. His passion for sculpture in particular was born at the Williston Northampton School in Easthampton, Mass., where he mastered the art of throwing clay pots. 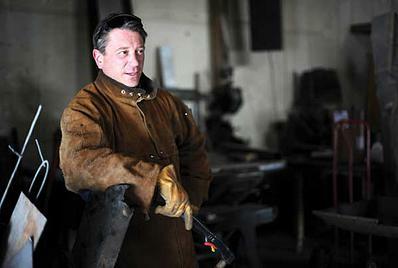 While earning a bachelor’s degree in fine arts at Alfred University in New York, Mark learned to sculpt with steel, and after discovering the metal’s tensile strength and the interior structural complexities it allows, he never touched clay again. An apprenticeship with Terrence Karpowicz Studio in Chicago, Illinois, sealed Mark’s deep desire to create with steel and stone; it is work he feels compelled to perform. Mark has created over 450 sculptures that adorn public spaces across the country, including pieces commissioned by or on display at The Los Angeles County Airport in Los Angeles, California; Upper Iowa University in Fayette, Iowa; and Wilmette Medical Center in Wilmette, Illinois. He is fueled by the knowledge that his work is limitless; he can build anything he can imagine. These geometric monumental sculptures and fountains, in rock, steel, and bronze create the illusion of a delicate balance and a lightness that deceives the mind into believing that they are something that they are not. Each piece brings together opposite elements to create a cohesive whole. The use of man made materials give the work its structural element, than balances it with natural materials like stone an wood creating a visual and structural duality within each piece. These massive sculptures nimbly suspend slabs of stone weighing well over a hundred pounds as easily as if they were constructed of styrofoam. Some of the static pieces give the feeling that they will topple over in the wind. Mark specializes in commission work where he creates one-of-a-kind specific works of are that captures the location of the work and the client’s vision. Mark also sells sculpture he was moved to create on his own.